Do you have different home locations? Does your dog vacation with you? Where are they apt to get lost? What information will make it EASY for anyone finding your lost pet to return them safely to you? Consider putting a home and cell phone on your tag. You may be out searching for your pet when your home phone rings! 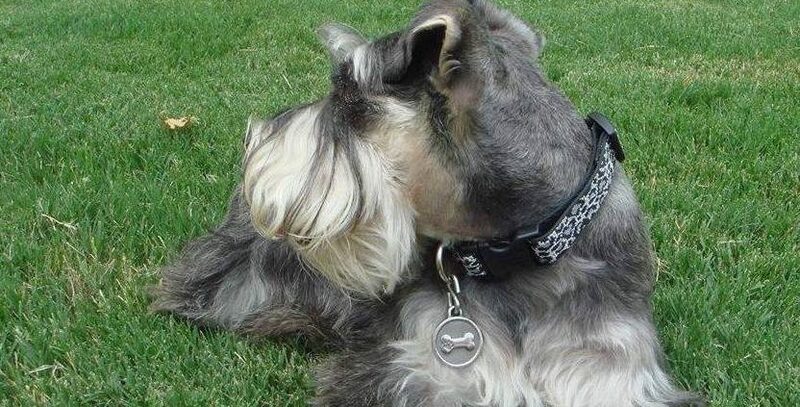 Your pet’s name is usually the first line of a tag, but you may choose to put only your last name on this line. Avoid putting a first and last name on one line because it gets cramped. Phone numbers are the most important information you can put on a pet id tag. You cannot have too many. A street address and or town are secondary. A readable tag is what’s most important! NO NEED FOR ZIP CODES!!! How many lines of engraving can I fit? The large tags can accommodate up to 5 lines of engraving with no more than 17 characters per line, including spaces. The small tags can accommodate up to 3 lines of engraving with 12 characters per line, including spaces. We highly recommend NOT trying to squeeze the maximum number of characters onto your lines. Less is more when it comes to readability!!! What if I move and my address and phone number change? 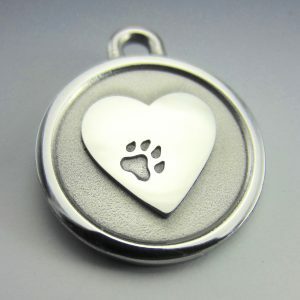 Should you need your engraved pet id tag information changed, contact us. Ship the tag to us in a SECURE envelope. We will refinish/ re-engrave your small or medium tag with your new information for a fee of $10.00. Large tags are refinished/re-engraved for $12. Both fees include shipping. No need to buy a new engraved tag! What if my pet is microchipped? Microchipped numbers can be very long and may not fit on a tag’s line. Vets and shelters are the only place a microchip can be scanned. You want whoever finds your pet to return them quickly, easily, and at the least expense of time and energy to them. Phone numbers are the most important. How big and thick are the tags? The large tags are 1 1/2″ in diameter. They weigh .75 ounces and are 1/8″ thick which is roughly the same thickness as a penny and a nickel stacked together. They are perfect for dogs weighing over 80 lbs. The medium tags are 1 1/8″ in diameter. They weigh .5 ounces and are 1/8″ thick. They are perfect for dogs weighing between 15 and 80 lbs. The small tags are 7/8″ in diameter. They weigh .25 ounces and are 1/16″ thick which is roughly the same as two dimes stacked together. They are perfect for dogs or cats weighing under 15 lbs. Can you put a name on the front of the tags? Because our tags have a raised graphic on the front, we are unable to put any engraving on the front of a tag. Only the backs of our tags can be engraved. Will my engraving be centered? All our tags are engraved using an electronic computer program which automatically centers and adjusts your information. Do you have different fonts available for engraving and can I use capital and lower case letters? We use Arial and Segoe Print fonts for all id tags because of the importance of creating a very simple, readable tag. The lines of engraving can get thick and deep. Fancy fonts tend to be difficult to read. We will usually use the Segoe Print font on keychains. Capital and lower case letters may be used for both fonts. 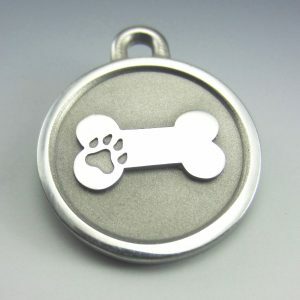 What kind of hardware do you supply for attaching the tag to a collar? We provide two different types of stainless steel hardware with every tag. The first is a split ring which is easy to get on but not very secure if your dog is active and tends to get caught on branches etc. It will open up if gets pulled too hard. The second type of hardware is an S-hook which is the strongest. It is made from 10g stainless steel and it is the most secure attachment we have found. You will need a long handled pair of pliers to get enough leverage to close the hooks around the tag and the collar loop. 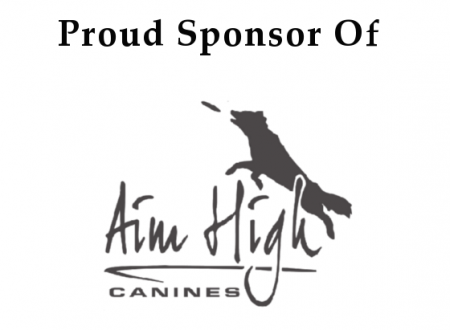 It is perfect for dogs who loose their tags often. Our tag guarantee does not cover lost tags so it is important to choose your hard ware wisely! My dogs have chewed all their tags. Can you guarantee your tag against chewing? Yes! Because these tags are so thick and the material is so hard, they are indestructible. You may find little scratches around the edges from teeth, but that will be the end of it! How long does it take to get a tag? We engrave and ship within 24-48 hours of each order receipt, except on the weekends. You have the option to choose either USPS Priority Mail (1-3 days) or USPS First Class Mail (up to a week) from Maine for shipping. Can I arrange to have a different shipping option? Yes, just contact us and we will do everything we can to accommodate your needs. Zoey showing off her new tag!